The great room is the heart of every home. Set in the center of the home, it’s used for many different things that bring the family together. Because of this, it’s a place that deserves special attention in a home renovation or if you’re designing a new custom home. When it comes time to bring new life to your own great room, seeking modern architectural trends is the best way to get a gorgeous design. Here are some of the most popular and beautiful trends that will give your great room a stunning and modern flair. This works for both a large living room and for homes on the smaller size. Give something in your great room special focus and build up the rest of your design around it. Fireplaces are an easy target for this kind of design. They often draw your eye when sitting in a great room so give them extra attention as the true centerpiece they are in a room. A central focal point aids in the mood you want your great room to have and elevates the entire look to a whole new level. Most great room ideas start with a color scheme. One of the best ways to plan out a color scheme is to start with similar colors. Blues and cool-toned purples work great together, for example. Then, you want to pick an accent color. Something that pops out amongst those chosen blues and purples. Complimentary colors will bring the rest of your chosen colors to life, making them appear brighter and more vibrant. A summery yellow, in this instance, would play off well with the blue and purple mix. Natural sunlight gives us many health benefits and it’s also attractive. The more sunlight incorporated into your great room, the better. It shows off your design in the best way and gives your room a strong connection to nature. 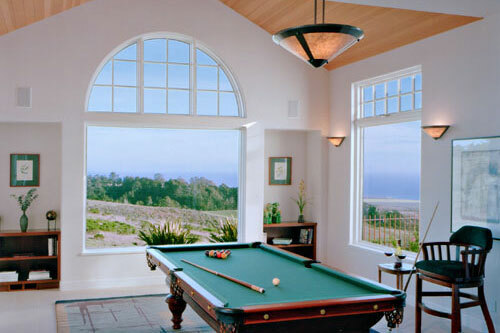 Floor-to-ceiling windows are the best way to get the most sunlight into your great room. With their help, you’ll save on money during the day since you won’t need to turn on any lighting. Plus, it will make the room feel even more open and large. One of the newer great room ideas that is growing in popularity is using ceiling beams within a design. Instead of trying to hide these beams away, homeowners want to incorporate them into the design elements. They provide a natural way to break up such a large room without crowding the floor space. This gives you an easy way to set up your great room furniture arrangement. All without the need for walls that will kill off that desirable open and airy feeling. Using architectural trends in your renovation design is a tried-and-true way to bring a whole new level to your home. They’re popular and loved for a reason. You will love them too! Having such a beautiful great room makes you want to spend more time there with your family. Any reason to spend more quality time with family is a good thing in our book. If you’d like to learn more about renovating or building a great room, contact us at any time and we’ll help you every step of the way!